The new da Vinci surgical system can be used in a number of specialties, including urology, gynecology, bariatrics, and general surgery. “I plan on using the robot for hysterectomies, myomectomies (removing uterine fibroids while preserving the uterus) and any surgery where I am concerned about potential scar tissue,” explained Dr. Sara Amo – an OB/GYN at WMH Sault Women’s Healthcare. 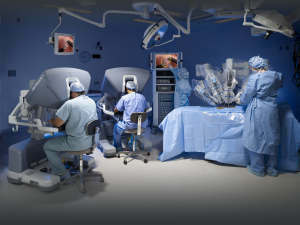 “The robot offers us a lot of advantages over traditional laparoscopy such as being able to see in 3-D and having a greater range of motion with our instruments,” Amo added.